On this blog I can sometimes give the impression that an unbridgeable gulf exists between restaurant industry people and people who merely like food and wine a lot. It is true that people who've spent time working in restaurants at a certain level tend to drink more, tip more, sleep around more, and generally manifest in their daily lives the influence of the pirate ship ethos that more or less reigns in these restaurants. All this is relative, say, to people who sit in offices. Restaurant industry people also often have a higher regard for manual proficiency and efficient hospitality, because these virtues are crucial to getting through each night. There is, however, something to be said for the value of outside perspective on the restaurant industry. Particularly in Paris, where some truly backwards and small-minded memes are insensibly entrenched, such as rudeness, sloth, inconsistent sham formality, over-reliance on set formules, and, what can be worst, a blasé attitude towards fine product, which behavior in some bygone era may have reflected the uniform excellence of French cuisine, but which in today's globalized GMO'd additive-heavy world just appears clueless. Ô Divin, a small cave à manger-slash-bar à vin tucked away beside a recording studio near the Parc de Buttes Chaumont, is perceptibly not run by anyone with serious restaurant industry chops. Co-owner Naoufel Zaïm previously worked in clothing retail, and came to love food and wine somewhat by chance. It demonstrates that experience isn't everything, because, as the Native Companion and I discovered the other night with our friends M and J2, Zaïm has succeeded in creating one of Paris' greatest wine bars. 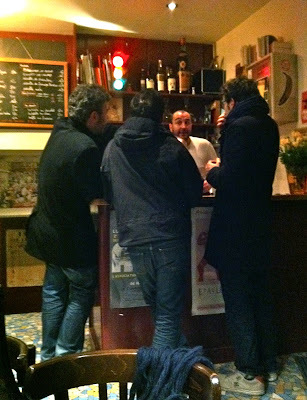 This becomes even more of an achievement when one considers how few proper wine bars there are in Paris. Most of them have some kind of glaring disqualification, by my standards; either the wine is swill, or they function entirely as a restaurant with zero bar atmosphere whatsoever. Ô Divin, by contrast, is home to a great selection of offbeat, inexpensive, 100% natural wines, and precisely none of the self-seriousness or pretension that can at the worst of times accompany their service. The night we visited, I was delighted to be introduced to the wines of a natural Beaujolais producer I hadn't previously heard of, Raphaël Champier. While waiting for J2 to arrive, M and the NC and I shared a bottle of Champier's "L'Amuse Bulles," a Vin Mousseux from Gamay, or, in other words, sparkling declassified Beaujolais. Just the concept puts a grin on my face. Low alcohol (11,5%) but free of residual sugar, it was among the most deliriously drinkable wines I've had in ages. The bottle disappeared almost as soon as it was opened, like a cascade of raspberries flowing directly from glass to mouth. Via the scant web info available on him, I gather that Raphaël Champier has 8ha of vines in Beaujolais-Villages, and is based in Odènas. I was less impressed by the his 2010 Vin de France still red cuvée "La Marginale du Beaujolais." Let's just say the wine was unfortunately aptly titled, tasting like somewhat watery, loser-soil Beaujolais. Nonetheless I remain curious to taste more of this Champier's wines (it seems to be a pretty common name there), not least because natural Beaujolais is only getting more and more popular, and it's worth having some underdogs in mind for those nights when one is feeling too tight for Foillard or Decombes or Metras (among others). Special mention must be made of the brandade de morue, which was among the only dishes I've ever tasted in France that arrived at the table salty enough for my liking. Also the presentation is cute, like a little made bed of brandade. If we didn't try dessert, it's perhaps my fault, as by that time of the meal I'd become distracted by the bar's adjacent enclosed courtyard terrace, which is no doubt greatly responsible for Ô Divin's enjoyably rangy atmosphere. I kept wandering out for cigarettes and wandering back in, past folks eating meals and folks just drinking and folks perched at the tiny service bar chatting with Nafouel, who ran the show throughout with maximum kindness and charm. 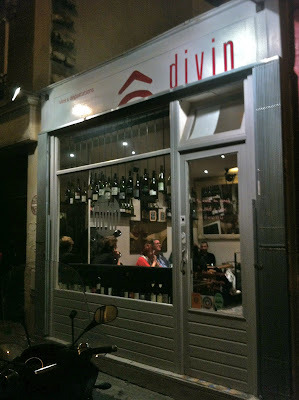 How is it that someone with little prior restaurant experience could create a place like Ô Divin, the sort of wine bar I've been praying to find ever since I arrived in Paris? The only explanation I can think of is the obvious one: some people are just naturals. * Pimente d'Espelette, from the Pyrénées, is the only sort of spice one ever seems to encounter in France. It's fine, as long as you don't expect dishes made with it to contain any actual measurable spice component. It's the spice equivalent of a blown kiss, and about that hot. 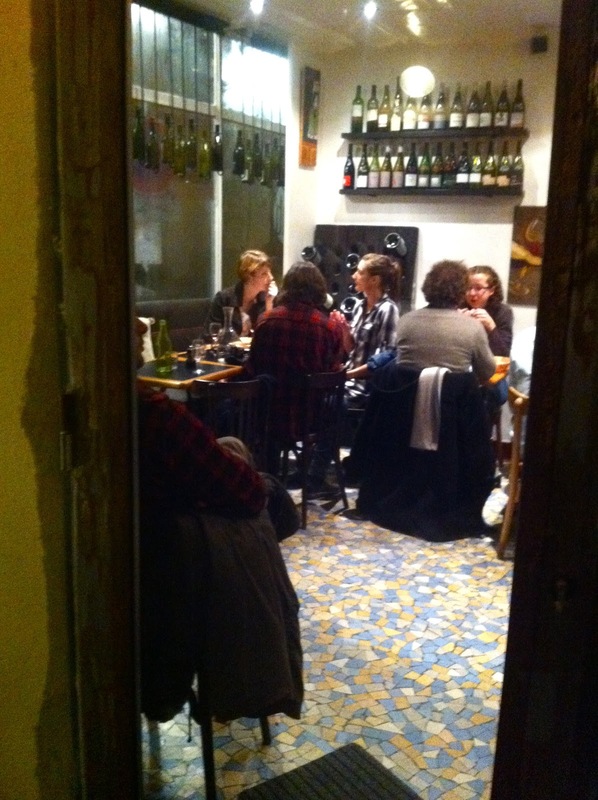 I recommend you try La Refuge des Moines in the 17th, in an unexpected corner of Paris. Had a fantastic meal there along with great service. That great server recommended fantastic wine pairings with each course, so between the two of us I think we tried a combined 7 or 8 wines by the glass. I'd say the place leans more to the side of restaurant vs wine bar, but the mile-long wine list and cool display of decanters definitely says they're all about wine. clotilde: i am open to just about anything. although i think i'd propose marketing it as a maquillage or something, rather than a spice. lynn: many thanks for your recommendation. i haven't been, but will try to check it out next time i'm in that part of town. I'd like to know more about the prices by the glass as I've so often been disappointed (and more than a little annoyed) by the often ridiculous overpricing of wine by the glass in trendy parisian bars à vins, often equivalent to the price paid for by the owner for an entire bottle. This should be the subject of a thorough investigation. I find such practices more and more unacceptable, especially when one knows how much wine by the glass or the bottle costs in Spain, which has, in my experience, one of the best bar cultures around. You know how much a Terras Gauda costs. In Spain, I’ve paid 18 euros for a bottle of that Albariño in some of the best Basque restaurants (non Michelin starred though), and 2 to 3 euros is the standard price for a glass of wine in good tapas bar in San Sebastian, for example. It's cool that Ô divin serves Champier, I did not know his stuff either, but to be really attractive, this new venue should display more originality (and committment) as, judging from your post, most of the usual suspects are the go here (Foillard, Métras, Descombes, Rateau, Richaud (priced at 36 € a bottle no less!). When I go to a new place, I’m looking for something that will branch out from the dull orthodoxy of parisian organic/natural wine bars serving the same stuff. The aforementioned are great winemakers for sure, but we’ve been drinking their work in Paris for decades, and the Beaujolais and Rhône regions, to name but a few, have so much to offer, and sometimes – nay, often — cheaper. Just one other thing : sure, France is not Thailand, India, or Indonesia when it comes to spices, if you limit the term to those which are also hot, which is actually an exception as most spices are not hot. However, we have more than piment d’Espelette (which does, in my humble opinion, alter the taste experience of a dish significantly) to offer – and piment d’Espelette does come in both mild and hot varieties. For example, there is another spice cultivated in France which is saffron/safran, which has been grown in Quercy/Lot since the Middle Ages, and is now protected by an IGP. It has also inspired a number of cooking recipes. anonymous: i don't understand your gripe about glass pricing in paris wine bars. i don't cite specific prices in the above post, but i do mention that prices at o divin are extremely reasonable - which makes sense, because it's a teensy neighborhood bar à vin in the 19ème. i can think of a few places that deserve that gripe, but none of them are mentioned in this post. otherwise, i find it hard to tell what axe you've got to grind here. the irrelevant section about spain leads me to believe you might have a stake in a tourism board or wine company based there. then you go on in the next paragraph to dismiss many great beaujolais producers (foillard, metras, descombes) only to later nonsensically compare their pricing with - beaujolais. additionally i might point out that it IS somewhat unusual to find a great deal of metras' wine in a paris wine bar. his paris distribution, like that of guy breton and chamonard, is perversely limited. you go on to cite saffron as being a spicier alternative to pimente d'espelette, which, in addition to making no sense whatsoever, gives the impression that you're clutching at straws to make corrections about this post. do you have an agenda here? are you olivier magny? i ought to disable anonymous posting. I was curious to see what you would reply to my comment, but unfortunately you seem capable of great intentional misreading, or perfect mauvaise foi. First let me say that if I posted as anonymous, it is because I otherwise have to refer to a blog or an url which I don’t have; that to post with a name I had to put a link to a blog or website. If not so, blame my poor internet 2.0 culture. I also do not work in the tourism industry and have no stake in Spanish wine, but I’d love to! I have absolutely no financial involvement in the restaurant industry either. 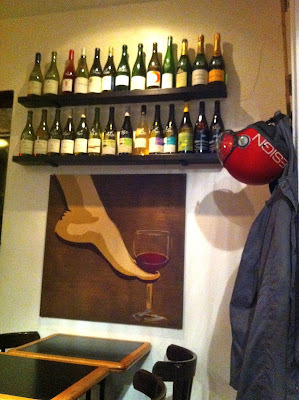 I am an long time restaurant customer based in Paris who is also crazy about wine. My first visit to a vinyard was Pierre Breton in 1990. Not much long later I celebrated beaujolais nouveau at the late Les Envierges (run by B. Pontonnier and F. Morel, — I guess you perfectly know who they are), with the likes of Foillard, Métras, Pti’ Max Breton and Descombes. You get the figure? Since then, I’ve relentlessly been roaming about France to discover wine. I also take part in the jury of Caves Particulières. I was at Rateau hardly a year ago. My name is Philippe Déan and my contact is philippe.dean@univ-lille3.fr. Let’s just get that clear, because your assumptions are really quite ridiculous and insulting, in addition to showing paranoïac tendencies, especially comicly directed towards that Magny dude who I don’t even know. Now let me take your reply point by point. First, the reason I posted is because you don’t cite specific prices. I think this kind of information is very important, nay, it is an essential aspect of wine bars, their accessibility, and their participation in French culinary culture and its perpetuity. That is, pricing is political. So I was posting to find out what they are by the glass at Ô Divin, because you are so enthusiastic about the place (“one of Paris' greatest wine bars”) and keep talking about the excellent prices, in relation to its 19th location. The neighboring Que du bon and Baratin politics of pricing have –alas— long showed that being located in the 19th or the 20th does not preclude from unfriendly prices on wine. 36 euros for the basic Cairanne of Richaud (not his Ebrescade), paid less than 10 euros by the premises, does not impress me. This is not my idea of an “offbeat and inexpensive” wine. I am being perfectly relevant, mind you. Especially when most of the selection is mainstream. I savour the names you praise from Beaujolais, indeed “great wine makers”, which I did underline. I criticize the monotony, conformism of fashion, the marketing abiding neophytes. Jambon, Lapalu, Thévenet are even rarer than Métras, who unlike Foillard, is not almost every two weeks in Paris to promote his wine. That is why you don’t find him as much as you’d like around here. To criticise should not be misconstrued as badmouthing, but to offer alternative way of seeing and thinking. If you can acknowledge that without taking it ad hominem. Second, maybe I did go on a bit of a rant about prices *in general*, maybe it is not enough clear that Ô Divin is not the direct target. How can it be, I have not been, I just read your post and some other posts on the internet about the place (no pricing info either). I thought comment sections on blogs were the place for having discussions like this, that it was an appropriate place to comment on the general practices of pricing as well as ask questions about the specific ones of Ô Divin. You yourself send us off to your own more general reflections about wine bars in paris at the end of the post. Third, the comment about Spain was to make a comparison with France, and develop the general theme about wine prices and bars. It was not “irrelevant”, just a collateral comment on a related link of yours discussing “Paris' paucity of good wine bars”. Need I write long paragraphs to make my argument clearer? Here is what I thought I had communicated: I love Spanish bar culture, and I believe one of the main reasons – no, the main reason – that people, of all kinds and classes – go out and drink good wine in Spain, is because of the prices: there is not even a x2 markup in a majority of places in the Spanish Basque country for example. That is why I mentioned it. I think France has much to learn from Spain on that area. And if I mentioned Terras Gauda as a pertinent benchmark, it was to get to the point faster, as you reviewed it. By the way, how much di you pay that bottle at Spring ;-) ? You maybe have not the same criteria for praising a place: that’s fine. I was just trying to express different criteria. I had hoped that more than natural wine canon recognition was behind your judgment when you consecrate a bar as “great”. In my books, I also need quality for money and the possibility of discovering new things. Otherwise I’ll sip them at home. And then, finally, you must have been too annoyed by my spice comment to read it properly. I said 2 things. Firstly, that piment d’Espelette comes in two varieties – spicey and mild. I am a bit Basque, so this matters to me. As you authorize yourself to comment on the taste value of piment d’Espelette, I authorize myself to reply based on a lifetime of consumption. I object to your statement that it is a spice that doesn’t have a ‘spice component’. You seem to be committing an error common to lots of anglo-saxons who eat lots of oriental food, thinking that spice is the same thing as hot flavors, which is not true. Spices can also have mild flavors, but this does not prevent them from being subtle and interesting. The second thing I said was that you can’t assert in your footnote that piment d’Espelette “is the is the only sort of spice one ever seems to encounter in France”. I was reacting to that, because there are other French spices that you will encounter if you spend a bit longer in this country, or if you did not write so peremptorily. The saffron was just an example of another spice we produce in France. I did not suggest saffron as an “alternative” to piment d’Espelette. What an absurd idea. It’s an additionnal fact you seem to ignore, although were very swift to comment upon. There is no grasping at straws here. I do not like to trade insults, but your misreading is more like grasping at straws against someone who voices a different opinion on spice, and who would appreciate a zest of modesty from someone discussing facts about a culture that is not his own. And on a spice that you do not, it seems to me, know particularly intimately – there seems to have been little contact in this kissing story, en effet. To sum up, although I have never met you and have only been reading your blog I think your reply to my comment says a lot about the relationship you have to your readers : arrogance. I hope you publish my reply, and I also hope that you will read more carefully before replying to your readers next time, otherwise they might get vaccinated from doing so, as I have now been. .. and how much is a glass of wine at Ô divin? Maybe you could give a few examples? ordering by the glass is for sparrows and pregnant women. i'm just kidding. but seriously, i can't remember exact prices. suffice it to say that a meal at o divin was downright cheap. now however the owner tells me he's revamping the concept a little bit this summer. so this post may or may not be accurate anymore. sorry !